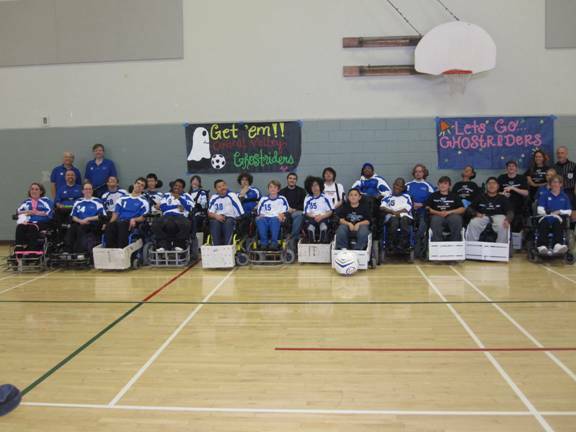 The BORP Power Soccer teams have started their new season with a full slate of games being played on Saturday November 13 and Sunday November 14. On Saturday, November 13, the BORP Bay Earthquakes traveled to Hollister for matches with the San Jose Steamrollers and the host Hollister Freewheelers. The San Jose game was a story of missed opportunities and match play rustiness for BORP. Both teams showed good passing attacks with the difference being that San Jose was able to find holes in the defense while BORP was not. Nonetheless the Earthquake coaches were heartened by the development of the BORP passing game, taking the defeat in stride knowing that the foundation has been laid for good things to happen for rest of the season. The Earthquakes squeaked by Hollister 1-0 in a well played hard fought game. Impressive passing was again on display in the Hollister game as BORP tested the Hollister defense again and again throughout the match. Hollister was able to stifle BORP until late in the second half when the Earthquakes Kendra Scalia-Carrow put in the goal that proved to be the game winner. The BORP Hard Drivers debuted against the Fresno Ghostriderz , suffering an 8-0 loss in the home opener on November 14th in the James Kenny gymnasium. The Ghostriderz, a newly formed team from Fresno came ready to play. Ghostrider Jaime Garcia put in the first goal with Tim McPheeters scoring two more goals in quick succession on goal keeper Jessica Roeckl-Navazio. Jordan Rutledge put a goal in on the near post. Keeper Hong Leoang blocked an indirect kick in the box and the Hard Drivers mounted an offensive attempt late in the first half with Milo Balcziunas, Eddie Contreras and Tyrone Cobb bringing the ball down the court well but having their scoring opportunities blocked by Ghostrider keeper Bret McCullough. Hong and Milo teamed up to block a flurry of shots in the final minutes of the first half but could not stop the Ghostriderz striker Garcia, from scoring late in the half. Bret scored again in the final minute of the first half making the score 6-0. The Hard Drivers regrouped at half time and held the Ghostriderz to 2 goals in the second half. Jerome Davis of the Ghostriderz won a hard fought battle with keeper Hong to put one in four minutes in to the second half. The hard Drivers scored an auto goal to add to their troubles and then held tough on several corner kicks, keeping the Ghostriderz from scoring on any of their set pieces. Milo’s strong defensive play helped save several goals late in the second half holding the Ghostriderz to 8. The Hard Drivers then faced off again the BORP Crushers and ended up getting crushed 7-0. The Crushers scoring onslaught was led by veteran player # 88 Ian Kinmont who put in two quick goals less than five minutes into the game. Hard Drivers Hong and Milo managed to stave off several more scoring attempts, including a double save on a middle shot off a 2 on 1 in the box penalty. Milo, Tyrone and Eddie had some good ball handling and threatened to score in the first half but were denied by Crusher keeper Stephan Dykstra. Tyrone and John Starks collided sheering off the guard on Cobb’s chair, which allowed Jessica to get back in the game while repairs were made. Margaret Mele had the next Crusher goal in last few minutes of the first half. Talia Geliebter and April Bryant moved the ball well down the court but it was Ian who scored the final goal of the first half for the Crushers. Brian Larson put the first goal of the second half in for the Crushers and then followed it up with 2 more to make the final score 7-0. The BORP Crushers revved up their offense with a 5-0 win over their stablemates, the BORP Bombers. Margaret Mele led the charge with 2 goals and Ian Kinmont, Talia Geliebter and Brian Larson all chimed in with 1 each. The Bombers were coming off an earlier match victory against the Fresno Ghostriderz and they showed some fatigue from that hard fought game but still put up a valiant effort and never let the Crushers relax. The Central Valley Ghostriderz had their debut game in Berkeley against the BORP Bombers on Sunday November 14th. The first half of the game was very competitive. Both teams displayed good passing and spacing throughout the game. Bomber #35, Emile Perry, brought the Bombers into the lead with her score as the 1st half ended. With the start of the 2nd half, Bomber Stephen Dykstra, was able to score against the Ghostriderz goalie Tim McPheeters, followed 5 minutes later by another goal by Perry, ending the game with Bombers winning 3-0. The Revolution was wonderful as usual. What a day! Sam, his brother, Brad and his cousin, Ryan, rode the 25 mile and then enjoyed a massage or two at the Trentadue Winery afterwards. The weather was perfect and the trio made excellent time. As always, there was plenty of food and drink —even for those three! Paralympic coaches told Sam to continue lifting and to add a muscle restoring drink afterward. One of the other athletes on the team recommended Muscle Milk. It’s very important that he not eat or drink anything with a banned substance in it so, after reading all the labels, Sam went to the United States Anti Doping Association web site to do some research. Feeling secure that there wasn’t anything besides protein, vitamins and minerals in the drink, Sam now drinks a Muscle Milk after a lifting session. Sam’s blood tests at the Paralympic Training camp were perfect. His cholesterol and triglycerides were down and he had gained a few pounds but reduced the size of his waist. Muscle weighs more than fat so the weight gain with associated “v” shape was really good news. Cycling and weight training is definitely doing the trick. His weight training program consists of rapid lifts of increasing weight. By stretching before, during and after, he never really has any pain from the lifting. 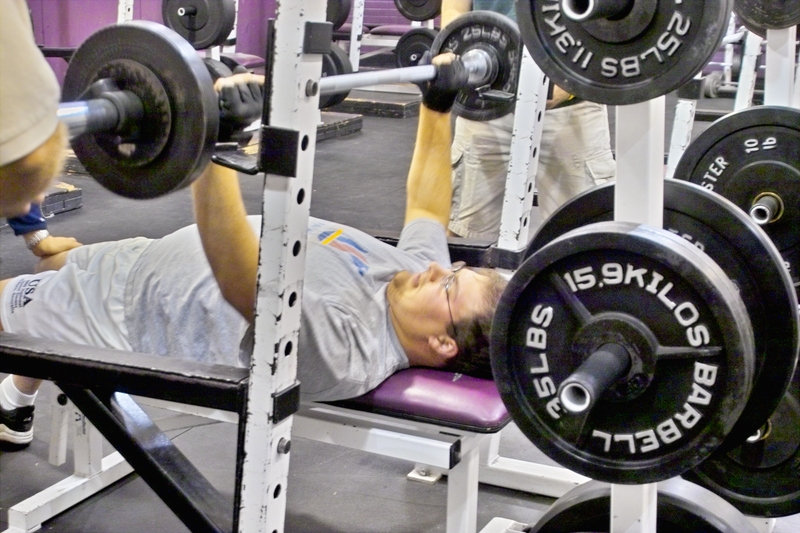 He starts with the shoulder incline press, lifting 90 lbs, ten times, to warm up. With 2-3 minutes between different weights, he then does 6 reps at 220 lbs and 10 at 190 lbs. as fast as he can. He finishes with that machine by doing as many as he can at 90 lb. and moves to the chest decline machine where he goes through the same type of routine with 10 reps at 150 lb, 8 reps at 220lb and 6 reps at 250lbs, with a burnout (as many lifts as he can) at 150lb. He then does hanging crunches (40 reps of 20), and ends the workout by pulling a 45 lb disc as he crawls backwards up and back across the gym floor. We are getting close! He will bring only a few pairs of shorts and T-shirts to the next camp, December 1-11 as he will be coming back with a suitcase full of his new uniforms. Nike is the sponsor, so Sam has to go through his wardrobe and make sure anything he packs is plain or has a Nike logo on it. A big part of the whole experience is learning to be on time and ready to perform. Sam has learned how to time his training so he has about a week of rest before he has to throw. He has also learned how to keep up with the team’s grueling schedule. He showers every night and lays out all his clothes and gear for the next day before he goes to bed. It would be a shame to get this far and then miss his event!